So the other day I did a post mentioning that I bought this palette and i've been completely obsessed with it ever since... it's the Makeup Revolution Flawless 32 eyeshadow palette. It has so many pretty shades perfect for creating night looks or day looks, matte looks or shimmered looks and all for £8 which I think is a great bargain! So starting with row one: the first shade in this palette is paper. It is a matte shade and is the most disappointing shade in the palette for me. It's a cream shade but it is really lacking pigmentation but is good for like base before putting on other shades. The second is soft glow it is a pearly shade and perfect as a highlighter under the brows or in the inner corner. The third shade is buff and this shade definitely stood out to me and is one of my faves. Buff is a gorgeous shimmer taupe colour.. it's so pretty. The next is highlite has great pigmentation! It is very shimmery it might be a bit too shimmery for a highlite but it is a lovely like whitey shade with silver shimmer. Angel again is a shimmer shade and has super pigmentation, it's a pretty yellowy gold shade. Unlimited is a gorgeous mid tone brown with a hint of shimmer, can't wait to create some everyday looks using this. Brew is another of my favourites its a shimmered coppery brown shade I would say so gorgeous. Lastly on row 1 is silver smoke i'm not much of a silver eyeshadow user but this would be nice to use for some night time looks/smokey eyes. Out of row 1, I definitely love brew & buff the most! Now for row 2: the first shade is called almost there and again another matte shade which aren't as greatly pigmented as the shimmer shades in the palette but perfect for an everyday toned down look. It's a lovely muted brown colour. The second is undercover again another matte in a light beige again I would use this as a base shade. Barely pink is a shade that surprised me normally i'm not really into my pinks but this one definitely caught my eye. Its a lovely subtle pink shimmered shade perfect for spring. Lowlite is definitely my favourite on this row it's a lovely shimmer brown shade.. I don't know what shade of brown to describe this so i'll let you decide from the swatch pic. Golden night is a lovely gold shimmer again one with great pigmentation. Gold digger is a Copper/orangely gold shimmer which I like to wear all over the lid when i'm having a copper eyeshadow day. Cheerless is a shade i'm undecided on whether I like or don't. It's a shimmer shade in dark brown with hints of purple. Lastly is blue not an exciting name which is a very dark navy blue, don't think I will get much wear out of this. The shades that stood out to me on this row are barely pink and lowlite. Although both gold shades are gorgeous too. Row 3 and onto some warmer shades: The first is a matte brown known as smudge. I think this would be lovely paired with almost there in the corner of the eye. Shimmer heart is another pretty pinky colour but lighter than barely pink.. definitely a shade I would use as a highlighter. Next is universal again a shimmer shade red/brown shade. Copper shimmer is definitely a deep copper shade than gold digger. Medal is the the in-between copper of gold digger and copper shimmer and is my favourite it's so gorgeous and has great pay off. Darkest shimmer is like a brown with red shimmer running through it. Tarnish is like a greyish darker brown, lovely to use for a smokey eye. Black tie is the last one in the row and is a matte black with bits of silver glitter/sparkle which I don't know if you can see in the picture. The row winner is definitely medal! The final row in the palette: pure chocolate is a deep brown chocolate doesn't translate as well in the picture but its a nice enough matte shade. Raw is my favourite matte shade in the palette its like a muted taupe colour perfect all over the lid when you just want a little bit of colour. Red night is going to be one i'm going to be obsessed with it's a red shade and I can't wait to wear this for a night out. Molton Chocolate is dark brown with a lighter brown shimmer, it's gorgeous. Burgundy night again is shimmer and is another of my favourite and main reason I bought this palate as i've been after a burgundy shade for ages. Greenstars is the only green shade in the palette and is beautiful. It is a dark green with lighter green shimmer running through it.. I just don't know when i'll wear it though. Cafe noir is a matte grey brown nothing special. And lastly night, your classic matte black which i'll use for smokey eye looks on on my top lash liner. That's all 32 shades talked about. All eyeshadows apply nicely with either finger or eyeshadow brush and blend really easily. I found using a eyeshadow primer has definitely helped with the lasting power of these shades but it's not a necessity (might be better for a night out to use a primer). 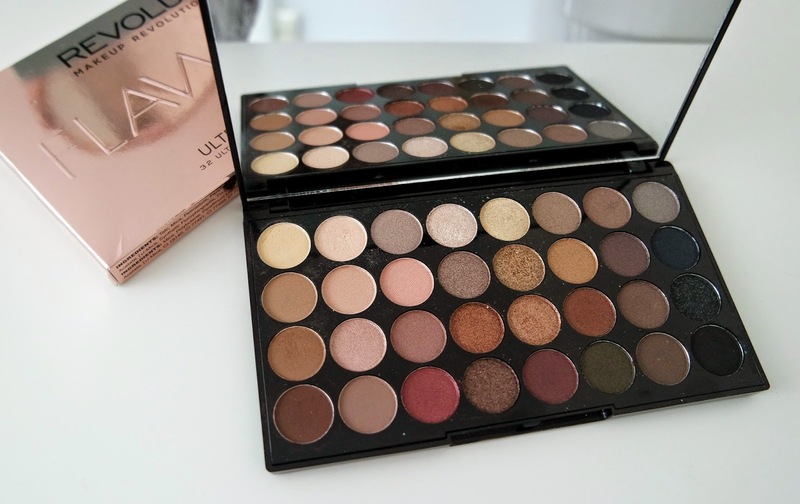 I would definitely recommend this palette to anyone & definitely considering getting other versions..
Let me know what you think of this palette, whats your favourite shade? I love how you actually applied the eyeshadow as well! Looks like a great palette! I can't believe how many shades you get for £8! That's amazing and definitely a cheaper alternative to the naked palettes! What a great palette! Definitely on my wish list! Oh wow, your swatches are amazing! I love the way you have done every shade on your eye lid! I swear Makeup Revolution products are as good as products more than double their price. 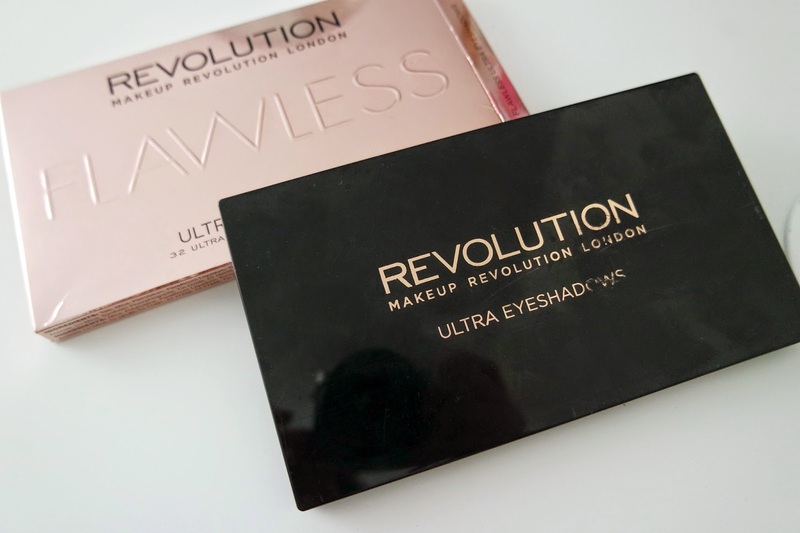 This was my first makeup revolution palette and it's still one of my favourites! There's so many different shades to choose from and it's so cheap. I really like the way you've done the swatches on your eyelid, I've never seen someone do that before! 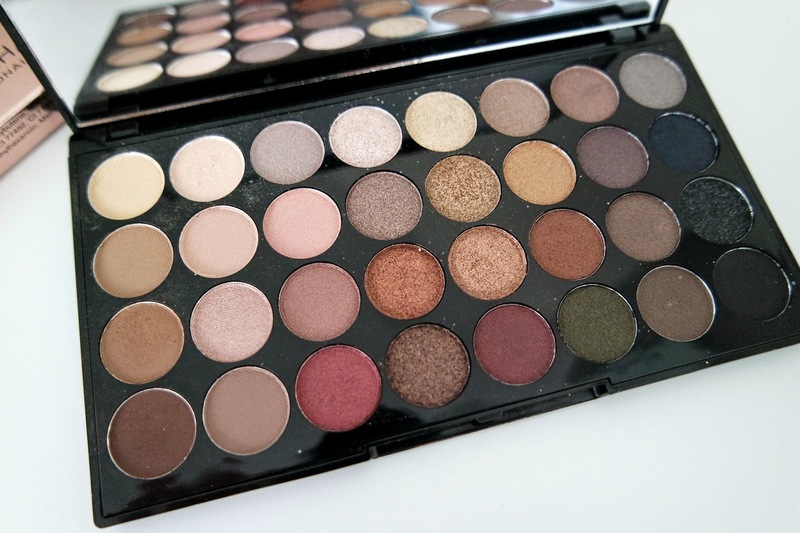 Omg at first glance, this looked like a palette full of Mac shadows. I love these colors, and the swatches look really good! Seriously, this needs to be available worldwide!!! I love how this palette has a green shade in it!